Voices for Virginia’s Children is pleased to announce the 2016 honorees of the Carol S. Fox Making Kids Count and Theodore R. Groves Memorial Awards! The Making Kids Count award recognizes a Virginia individual and an organization for exemplary efforts to improve the lives of children in the Commonwealth. The newly created Theodore R. Groves Memorial Award will recognize two organizations that promote racial and ethnic equity for Virginia’s children through their work. Click here to read more about the criteria. Jeanine Harper, of Richmond, has been changing the way we help children heal in our community. Jeanine has been the Executive Director of Greater Richmond SCAN (Stop Child Abuse Now) for over 16 years, leading her team with unparalleled strength and kindness. Jeanine leads SCAN’s staff and volunteers to provide awareness, support, and education to enhance the lives of our most vulnerable children, those at-risk of abuse or neglect or who have been abused and neglected. This past year, Jeanine has built partnerships with local school administrators within the Richmond Public School system to help expanding a trauma informed approach in the division’s Pre-K-12 programs. She has also served as a loaned executive to the Department of Social Services when the number of reported child abuse victims across Virginia topped 50,000. ART 180, of Richmond, was founded in 1998 to give young people in challenging circumstances the chance to express themselves through art and to share their stories with others. Their programs are offered at no cost to participants. Over their 18 year history, they have served 3,500+ young people in programs fostering creative expression. Most of the participants are from single-parent or non-traditional households, low performing/under-resourced schools, the foster care or juvenile justice system, identify with a diagnosed behavioral challenge, or from the LGBTQ community. By giving youth a voice through the arts they not only speak out for children, but also empower them to speak out for themselves. They help to position young people as agents of change rather than targets of change. Hopkins House, of Alexandria, was founded in 1939 by a group of teachers committed to providing child care to African-American children in segregated Alexandria when government funding for their care was cut. The teachers named the new center for Dr. J. Milton Hopkins, a local African-American physician who for years had provided medical care to anyone in need, regardless of ability to pay. From its beginning serving 24 children, Hopkins House has grown to an enrollment of 315 children at three preschools in Northern Virginia. In addition, the organization collaborates with national, state and local governments on a range of public policy matters affecting children and their families, including health, housing, and education. In collaboration with Northern Virginia Community College, Hopkins House also assists 100 teens and young adults yearly earn professional credentials, college credits, and career placement in the early childhood education field. ChildSavers, of Greater Richmond, was established in 1924 as the first children’s mental health clinic in the South. ChildSavers’ fundamental commitment is to the mental well-being of children and the formation of a positive bond between children and their care providers. Their clients come from all cultural and socioeconomic backgrounds, but most have experienced the hardships of poverty and family turmoil. In the 2014/2015 program year, ChildSavers impacted 14,000 individuals and provided direct service to 2,967 children, family members, and childcare providers. Currently, approximately three-quarters of the children served are African-American while 76% live with families that are at or below 200% of the federal poverty line. In 2014 the Virginia General Assembly passed a resolution recognizing ChildSavers as the only trauma response program in the Commonwealth devoted to immediate response and trauma counseling services for children and acknowledged their long-term commitment to the mental health and developmental needs of children. 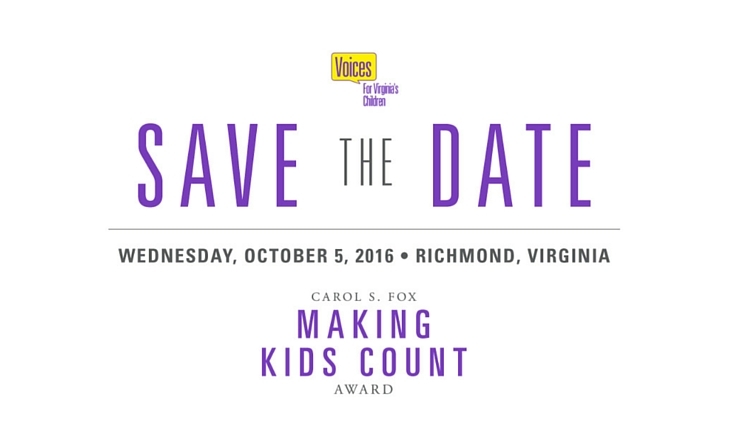 The 5th Annual Carol S. Fox Making Kids Count Awards Reception will take place on Wednesday, October 5, 2016 at 6pm at the Bolling Haxall House in Richmond. In attendance will be a host of child advocates, community leaders, Voices friends and supporters, program directors, elected officials and others who share a common purpose – improving the lives of Virginia’s children. Thank you to our Title Sponsor for the 2016 event, Dominion, and Reception Sponsor, AT&T. Other sponsorships are still available. If interested, please contact Michael Brown at michael@vakids.org or call 804-649-0184 ext. 22 for more information. For more information or to purchase tickets, please visit the event page. Download the media release about the award honorees here.